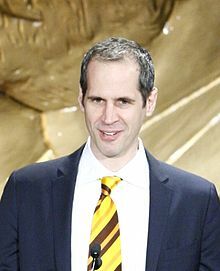 Alex Blumberg is an American entrepreneur, radio journalist, former producer for public radio and television, best known for his work with This American Life and Planet Money. He is the co-founder and CEO of the podcast network Gimlet Media. Blumberg at the 68th Annual Peabody Awards in 2009. Blumberg received a B.A. from Oberlin College and is currently an adjunct professor of journalism at Columbia University. From 1999-2014 he was the producer for the public radio show This American Life and his stories were regularly featured on the show. From 2007-2009 he was the executive producer of the television version of This American Life. In August 2014, he started Gimlet Media along with Matthew Lieber. Initially pitched as the American Podcasting Corporation (APC), Gimlet Media is a podcasting business. Blumberg documented the startup process in the first season of a podcast hosted on Gimlet Media, titled StartUp. The second season follows "Dating Ring", another startup company. Apart from StartUp, Gimlet Media has launched several other podcasts, including Mystery Show, Surprisingly Awesome, and Reply All. The company has raised $1.5 million in seed funding. After raising most of its initial capital from investment firms Betaworks, Lowercase Capital, and Knight Enterprise Fund, Gimlet invited the listeners of its shows to help raise the last $200,000 through crowdfunding platform Alphaworks. In December 2015, Gimlet closed a Series A round of funding that raised $6 million at a $30 million valuation. On February 6th, 2019, the Swedish audio streaming service Spotify announced that it had entered into a definitive agreement to acquire Gimlet Media. Blumberg won the George Polk Award in Radio Reporting for his reporting with Adam Davidson for a May 2008 show titled "The Giant Pool of Money". The piece explained the highly complex chain of events that led to the subprime mortgage crisis by showcasing interviews with participants at each sector of the crisis. The episode was linked widely in the blogosphere and remains one of the show's most-downloaded podcasts. He won first place at the 2002 Third Coast International Audio Festival for his story "Yes, There is a Baby." His story on clinical medical ethicists won the 1999 Public Radio News Directors Incorporated (PRNDI) award for best radio documentary. In 2009 he appeared on an April 12 Episode of NBC's Meet the Press to talk about the financial crisis. He shared three Gerald Loeb Awards: the 2013 Broadcast Enterprise award for "When Patents Attack" on This American Life, the 2014 Online award for "Planet Money Makes A T-Shirt," and the 2017 Audio award for his story "Dov Charney’s American Dream". ^ Schawbel, Dan. "Alex Blumberg: Lessons From His Transition From Traditional To New Media". Forbes. Retrieved 2018-04-14. ^ a b "Alex Blumberg, NPR Biography". NPR.org. March 26, 2009. ^ "Our Staff". thislife.org. March 26, 2009. ^ Blumberg, Alex. "The Financial Crisis And You: Planet Money on Crisis Basics". The Washington Post. October 15, 2008. ^ Zimmerman, Eilene (9 December 2014). "Documenting the Journey From Public Radio to Start-Up Owner". New York Times Blogs. The New York Times Company. Retrieved 29 April 2015. ^ Bellstrom, Kristen (23 April 2015). "Why these founders are airing their dating startup's dirty laundry on a podcast". Fortune.com Most Powerful Women. Time Inc. Retrieved 29 April 2015. ^ Zinsli, Christopher (2014-11-11). "'This American Life' Producer Raises $1.5 Million for Podcast Startup Gimlet". Wall Street Journal. ^ Quah, Nicholas (8 Dec 2015). "Hot Pod: Panoply's parent company takes a stake in Gimlet Media". Nieman Lab. Retrieved 8 Dec 2015. ^ "Spotify Announces Strategic Acquisitions to Accelerate Growth in Podcasting". Spotify Investor Relations. 6 February 2019. Retrieved 6 February 2019. ^ E&P Staff. "George P. Polk Award Winners Announced". Editor and Publisher. February 16, 2009. ^ McIntyre, Jamie. "Defogging the Economic Crisis ". American Journalism Review. March 10, 2009. ^ "'Meet the Press' transcript for April 12, 2009". MSNBC. April 12, 2009. ^ "UCLA Anderson School of Management Announces 2014 Gerald Loeb Award Winners". UCLA Anderson School of Management. June 24, 2014. Retrieved January 31, 2019.